Showing 1 - 15 of 37 articles tagged "syndication"
The motivational speaker, life strategist and author's one-hour syndicated talk show is scheduled to premiere in syndication on Sept.
FXX and Freeform have become sibling cable networks as part of the Disney-Fox merger. 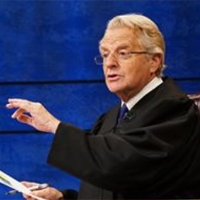 Judge Jerry will air in syndication on 206 stations beginning this fall, with episodes mostly airing in two-episode one-hour blocks. The Joss Whedon favorites will be free to watch for everybody.